Sorry, but it does not. The question was whether solar activity and surface temperatures were always coupled in the holocene, or whether there were other periods of uncoupling. 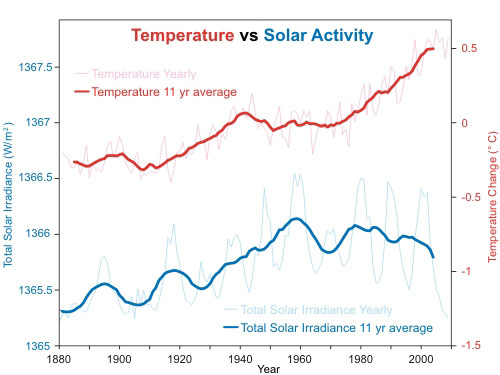 Your graphs do not contain any data of solar energy output at all. So the question was not addressed in your response. I understand you have preented data comparing CO2 to surface temps, but that is not what I asked. "To date, the only proxy providing information about the solar variability on millennial time scales are cosmogenic radionuclides stored in natural archives such as ice cores." Perusual of the various versions of this post, plus the graphs I showed you in My Previous Comment #749 reveal the tight relationship between solar variability, CO2 and temperatures (with temperatures being merely the composite sum of forcings and feedbacks) in the paleo record. When did atmospheric concentration jump 40% (which it has over the pre-industrial levels)? At any point? Do you see any uncouplings? 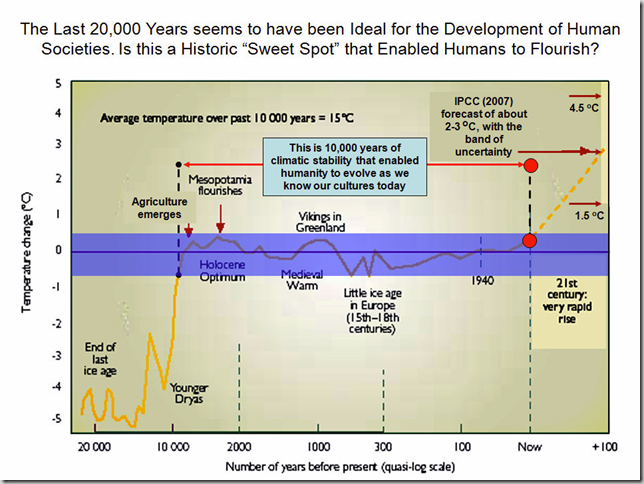 Keep in mind that CO2 in the paleo record acted as a lagged feedback to orbital factors and solar irradiance changes. And that it is now acting as a forcing. Or do you have a source for solar activity over the paleo record that materially differs from the information presented in the various iterations of this post, my comments and linked sources? If so, what source is that? Can you furnish a link? Your new post still does not answer the question. I do not see solar activity represented at all, except for the graph in the main article which covers only the past few hundred years. I understand temps and CO2 are uncoupled, but I was asking about solar activity and surface temps. Is the recent uncoupling unique in the holocene? I do not have the data myself. That is why I am asking the question. Perhaps what you are trying to say is 'we do not know whether solar activity and surface temps were uncoupled prior to the 1800s because the ability to measure solar activity is not able to be calculated prior to that time.' OK. So that is an answer. But repeating the CO2 data is not what I asked. Daniel gave you an example of solar reconstructions for the Holocene in his link to Beer et al, 2006. Specifically figure 2 panel c appears to be what you are looking for. I read the article, but unfortunately, that figure still does not answer the question, for two reasons: (a) the time scale makes it impossible to see the holocene in detail, and (b) it compares temps with insolation (angle and distance from the sun) and assumes a constant solar activity. I was asking specifically about solar activity (not insolation). But the paper does give something of an answer elsewhere. It says before the launching of satellites, solar activity could not be measured. So that is the answer I was looking for - "We do not know." The paper says the sun has activity cycles, but then assumes those cycles are regular. The author uses this to exclude solar activity variation as causative in the long term. We now know this is incorrect. In fact, the graph at the top of this page shows that solar activity (11-year averages) has varied over the past 130 years. The paper goes on to model solar activity based on proxies, and that is the best we can do right now. OK. Response: [Daniel Bailey] Apologies; I thought that the Beer et al quote I cited made that clear. I will try to be more explanatory in the future. Sorry I pointed you to the wrong section, the paper does go on to detail a solar activity proxy as you discovered. @TheCaz: in the absence of any evidence that there were similar "uncouplings" in the Holocene, we cannot assume there were. Thus, it's not the sun. It's CO2. Continuing from a comment here. "Solar variation did not cause the 78 – 98 warming but it can cause the 1880 to 2010 trend"
Barring the obvious fact that 78-98 are contained in 1880-2010, there is no evidence for this 'solar cause'. Sunspot numbers correlate well with satellite measures of solar irradiance and the reconstructions of solar output don't support it. If anything, the sun's relatively quiet behavior in recent years should have a cooling effect; yet we know that 2000-2009 was one of the hottest 10 year period in the last 6 decades. We've been through the cosmic ray discussion many times. There is no consistent evidence of any such effect. "the cooling would not be instant due to thermal inertia (i.e. the ocean is storing the cooling)"
The solar max occurred in the late 50s. Sixty years later, still no cooling. And for your own benefit, please don't ever say something 'stores cooling' in any public forum. It's like asking what is the speed of darkness? By 2012, when the sun is really cookin' and the Arctic ice recedes from the pole for the first time in unknown millennia, enquiring minds will want to know: Just how did those Mayans know? Reminds me of the world's fastest climatologist, Muhammad Ali. Sucker bet on hitting the thou. If I took it, all you'd need to do is drop the words 'climate sensitivity' in here. Cool Papa Bell was attributed to have said (OK, Satch said it) that Ali quote about a half-century before Ali. Lockwood 2010 Solar change and climate: an update in the light of the current exceptional solar minimum is an interesting summary paper for the Royal Society. ... the popular idea (at least on the Internet and in some parts of the media) that solar changes are some kind of alternative to GHG forcing in explaining the rise in surface temperatures has no credibility with almost all climate scientists. Sounds like he's got his head on straight. A combination of the increased TSI and UV may explain up to 0.44 degrees of the 0.55 degree HADCRU warming - 80%. #768: "shows further increases over the 19th and 20th centuries ..."
Figures 5 and 6 in the paper (pdf here) clearly show the solar UV max coincident with the late '50s 'grand maximum'. That suggests that in the 50 years since, the 4 subsequent solar maxima were flat to lower than this well-known peak. That's the key point in this post: between the 1960s and the present day the same solar measurements have shown that the energy from the sun is now decreasing. See the graph at the top of the page. On another note, when I was in the awl bidness, we referred to Mother Exxon as 'the double cross' - and that was before the Valdez. #769 I´m not sure that the peak values are the most important. The oceans are acting as large integrators and from the diagrams in the article in can clearly be seen that the overall imparted energy has increased (from the UV-band) until about the year 2000. Since UV have a higher penetrability than light in the oceans it is not strange to assume that variations in UV energy fluence may have some impact on the total energy content. The decrease in energy fluence after approx. 2000 is consistent from what is observed, i.e a stable decrease in ocean energy content (since 2002-03). This may eventually have an impact on the surface temperatures as well. (The word "may" should be used more often in climate science considering the uncertainties). Response: [Daniel Bailey] Your own linked graphic you provide in 771 below shows the fallacy of focusing on short time scales: Datasets are noisy; the overall trend is up, like global temps. Update: here is a couple of figures showing the latest (corrected) data on energy content of the oceans (one together with GISS-projections). Response: [Daniel Bailey] Further discussion on ocean heat content should go on a more relevant page. Use the search function in the upper left corner of every page to find a more appropriate thread if continuing a discussion of OHC is your intent. Thanks! #770: "not sure that the peak values are the most important. ... from the diagrams in the article in can clearly be seen ..."
Figure 5 in the Krivova paper is a graph of UV flux vs. time. In order to represent increasing energy, the area under the curve must increase: either the peaks must be bigger or the width (time duration) of the peaks are broader. The largest peak UV was in 1958 and the time duration of the subsequent cycles is the standard 10-11 years. What part of that is clearly demonstrating your point? If you are saying that the cumulative energy summed over all cycles is increasing, that's obvious. But that sum is not a measure of the energy balance at TOA or in the oceans. There is no mention of UV contributing to ocean heating. Their "value of about 1.25 W/m2 as our best estimate for the 11-yr averaged increase in the TSI between the end of the Maunder minimum and the end of the 20th century, compared to 1.3 W/m2 derived by Balmaceda et al. and Krivova et al. " doesn't specifically say that it increased through the end of the century. Further discussion specific to ocean heat content should go here. The current trend in sunspot number Cycle 24 is under the projected trend. NASA's 2006 forecast was ~150. The current predicted maximum of 90, in May 2013, may need further revision downward. I am reminded of the Penn and Livingston 2006 paper that showed a linear decline in umbral magnetic flux, suggesting that a continued decrease below 1500G may result in sunspots disappearing altogether. Response: So what? That's not relevant to the point of this post, which is a rebuttal of the skeptic argument that increase in the Sun's irradiation of the Earth is what has and is causing the Earth's temperature rise since about 1850. My understanding is that solar activity levels have been above the historical norm since the 1940's, See Cycle 21-23, and the correlation between surface temperature anomalies and sunspot cycle length is interesting. A NASA study showed that solar activity influenced the observed warming of the previous century by 25%. But cycle 24 looks similar to cycles 5 and 6, during the Dalton Minumum. It's still too early to say for sure but it is possible that a weak cycle 24 may lead to subsequent global cooling. Your understanding is incorrect. Please read the article you are replying to. As for a decrease in solar activity trumping the enhanced greenhouse effect, please use the search box to find the article on what would happen if the Sun returned to Maunder Minimum activity levels. #775 I did read the "What the Science Says." The article is is not factually correct. Do you disagree with the NASA study? Do you disagree that average solar activity levels 1950-2000 are higher compared to those for 1900-1950? 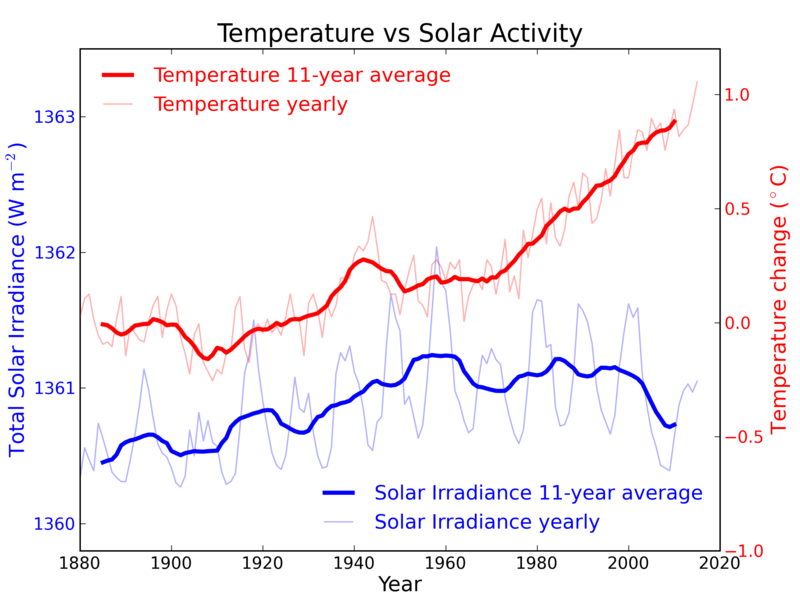 Please explain how a decreasing solar irradiance yields an increasing global temperature. Read the article, not just the one-liner summary. #776: "disagree that average solar activity levels 1950-2000 are higher"
A 12-year low in solar "irradiance"
and type in 1900.5 to 2009.5. The historical TSI reconstruction shows five 11-year solar cycles between 1900-1950 and five between 1955-2005. Clearly, the five cycles after 1950 were more active than the five pre-1950 cycles. I agree that cycle 24 is unusually quiet and supports my thesis that the Sun does influence global surface temperatures. In this case, if cycle 24 is longer and weaker than previous (21-23), then we may see subsequent global cooling in response. It's interesting to note that the solar max in 1970 (cycle 20) was relatively weak. I remember the "Big Freeze" in 1977 when the Chesapeake Bay froze over. thepoodlebites - Certainly, if the sun goes into a less active phase there will be an influence on climate. However, given the low amount of such solar variation, the effects of such variation are going to be tiny compared to CO2. See What would happen if the sun fell to Maunder Minimum levels, and also the comparative values of forcings here - I find Figure 2a very clear. I believe you've been pointed to these items previously. Global cooling? No. Warming perhaps a little slower if solar variation reaches a low? Yes. Nobody is arguing that variations in solar irradiance have no effect on the global temperature, rather that the effect from the enhanced greenhouse effect is larger. #781: When you get a chance, please fix the link to the original paper Feulner and Rahmstorf. Let's see, assume a minimal response to reduced solar irradiance (0.025 C), an enhanced response to CO2 doubling (3.4 C), plug these assumptions into the CLIMBER-3a model, and the model results support the assumptions. This result is a faulty form of reasoning that assumes the conclusions in the premises, i.e., circulus in probando. Thank you for such a wonderful example of circular reasoning in climate science. Not to mention that irradiance variations in the UV are not represented. And what is the uncertainty in the temperature predictions? Let's be reasonable, the atmospheric response to CO2 doubling may be (0.5 C), See Lindzen and Choi. Even the lower range of the IPCC CO2 doubling (2 C) is too high. Talk about over-forecasting. What do they say in meteorology? I think that your forecast is a bust. How is this circular? Assumptions for model inputs are required to run the models. The question tested is one aspect of the model -- the change in solar activity (On the effect of a new grand min is part of the title) in the presence of other forcings. Lindzen and Choi have been dealt with elsewhere ad nauseum. Here's a bit of free advice: Don't cite a source without checking to see if its been rebutted. I learned that one the hard way, back in the days of oral exams. thepoodlebites - You might want to take a look at a discussion of Lindzen and Choi, as well as How sensitive is our climate, where this comment belongs (minus the circular reasoning accusation). Multiple lines of reasoning, including both model runs that accurately reproduce past climate behavior, as well as empirical evidence such as seasonal swings and historic data, all point to a sensitivity of 2 to 4.5°C, most likely 3°C. So - going with a dis-proven outlier whose results agree with "business as usual"? Or considering that a lot of very smart people agree on a particular range? Personally, I consider the former to be wishful thinking... your mileage may vary. #785: Thank you for the link to the Lindzen and Choi 2009 paper. Sorry, my bad. I have found a pre-print of the 2010 update submitted to the Journal of Geophysical Research, On the observational determination of climate sensitivity and its implications. I think that the revised estimate is 1 C. I prefer an observational based determination rather than model driven predictions. Do you have a cite for your empirical evidence for climate sensitivity to CO2? As to circular reasoning, finding problems with Lindzen's 2009 approach does not address the problems with Feulner and Rahmstorf, assuming the conclusions in the premises. How about the uncertainty in the 2100 temperature predictions? How about the NASA study, the Sun does contribute to global warming, 25%. I still think that your predictions are a bust based on the surface record to date. And "business as usual" is a very important point, but it is off-topic here and best left unsaid. thepoodlebites - I've replied over on Is climate sensitivity low, the appropriate thread for that discussion. #787: Please, not the shotgun approach. Pick one or two papers, give me your favorite, an observationally based estimate of climate sensitivity to a doubling of CO2. The Feulner and Rahmstorf paper used 3.4 C, from A. Levermann, private communication, 2010. I am sure most here may not check the Astronomy sites unless they have a specific interest, but I thought you might all like to read this article. The article details the launch of a new satellite to more accurately measure total solar irradience so that better calculations can be made as to how much the Sun either does or does not contribute to the changing climate. From a selfish point of view, it should help astronomers better understand the Standard Solar Model which has some faults to it and thus enable us to get a better and more accurate model of the Sun, which would also help climate forecasting. We are well aware of ongoing efforts to better understand solar astronomy. Did you have point beyond asserting we just aren't as up-to-speed as you? #790 For starters, Mr. Cook should update Figure 1, replace the PMOD data with the new LASP data. The TIM instrument has measured a lower and more accurate TSI (1360.8) for solar min than PMOD. And the LASP historical TSI reconstructions show no decrease in TSI over the last three solar cycles (21-23). I have a friend who constantly bangs on about Piers Corbyn and his site ‘Climate Action’. Sadly I have very little time to research Corbyn’s claims. I was wondering if anyone has analysed Corbyn’s weather predictions comparing them to the main weather predictions of places like the met office and also his claims about making money by placing bets on future weather. I know this is about weather but Piers definitely believes AGW is a myth. Could someone look into his claims and perhaps do an article on him. There seems to be very little objective research done on his claims... that I can find anyway. We have Monckton Myths how about Corbyn’s Crocks? I posted here because I know Corbyn thinks its all about the sun. Johngee, it seems to me that Mr Corbyn is always predicting freezing, Arctic-like conditions and so, like a broken clock telling the correct time twice a day by accident, so does Mr Corbyn. Arctic blasts with heavy snow and blizzards in parts. I recall December being very cold, the coldest in a hundred years or something, but still he got it wrong. Um, quite the opposite actually. Well, not so far, anyway but who is going to rely on that being correct...except by accident ! Maybe I've been lucky not to have experienced any of that here in London ? ● ‘Global Warming’ forecasts will fail AGAIN. ● Carbon Trading & all CO2 reduction schemes must stop. ● ‘Warmers’ flee from challenge to present evidence for CO2 case. TIS... (From previous thread) What you are missing saying that the planet warms and cools 4C during the year is the trend. Take that same monthly series that I linked from NOAA and plot it on a graph. You see the series rise and fall the ~4C that you state. But read the rest of the page. This data is the basis for the anomaly. As the the planet warms that same series you plotted is moving upward. All the datasets plot this. UAH, RSS, GISS, CRU... They are all taking this annual cycle into account. "Explain the warmer July to me without using geography. ... if accurate, it does prove that geography plays a very strong role in global temperature." That's hardly an adequate 'proof.' But let's play with it anyway. Here's something that doesn't appeal to geography: Your statement 'the earth gets more energy in winter than in summer' clearly refers only to incoming solar radiation. It is certainly true that the peak value of solar insolation averaged across all latitudes at the time of perihelion (winter) is 7% greater than at aphelion (in summer), but isn't that primarily because the earth is closer to the sun in winter? During the winter months, outgoing longwave radiation actually exceeds incoming insolation producing negative net radiation values. The linked page gives examples for several other locations. So when length of day is taken into account, the 7% additional energy 'received' in winter is radiated away during those long winter nights; winters are colder than summer. It's so clear what is happening with TIS, and I see it in so many others who hold his position. They are in this constant process of confirmation bias. They start with the conclusion that AGW can't be correct and waltz through their way through the science locating the points that support that position. What they don't do is push past any of those points to fully understand the science because that endangers the conclusion they want to find. I often see this in students. They take a position based on something they've heard (or, sadly, been told by a parent or prior teacher) and cling to it no matter what. If, after a little Socratic give-and-take, you can see their doubt level rising, you can make a difference. However, some are afraid to simply admit that they've been misinformed or are just plain wrong. In the case of some of the most ardent skeptics, clinging to a pre-conceived notion frequently results in highly unscientific thinking -- and down goes credibility. In a case like this, realizing that net radiation is what matters leads to the next logical step: if we reduce the earth's outgoing radiation, the planet must warm. But that requires a greenhouse effect ... and that violates the pre-conceived notion. Illogical, does not compute! muoncounter @795, I'm afraid you are showing a Northern Hemisphere bias. Perihelion is not winter, but winter in the Northern Hemisphere, while being summer in the Southern Hemisphere. The reverse is true of aphelion. And the interesting facts about solar radiation and outgoing radiation that you point to apply approximately to all temperate and polar locations, regardless of their location in either the Southern or Northern Hemisphere, so it is not in itself the explanation of the phenomenon. This is complicated by geography, which influences the rate at which heat is transferred from the tropics to the poles. London, sitting close to a branch of the Gulf Stream, for example, will show a smaller (more negative) net radiation because it is substantially warmed by that current. Seattle would show a larger (less negative) net radiation because of the cold current of its coast (I believe). Both of these cities would show a larger net radiation in summer than, for example Moswow which would have hotter summers and cooler winters because of its inland location. In fact, overall the NH would display less of the disreprancy you indicate because of its larger land mass. That means fewer of its locations are close to the coast. It is that fact which in fact accounts for the Earth being warmer at perihelion (the NH summer). Temperature variations are smaller in the SH because so little of its land is far from the ocean, and there is so much more ocean. The greater heat capacity results in a smaller overall seasonal fluctuation in temperature. That means the NH seasonal fluctuation dominates overall, resulting in greater warmth during the NH summer, which coincidentally is at the moment during aphelion. Tom Curtis at 08:57 AM , I agree with the idea that geography is a factor and have posted on it on some other threads. I have focused more on the cycles such as ENSO which some people feel balances out once a cycle is complete, ignoring that it is the geographic distribution that determines what conditions each phase brings to a region, and thus all things are not equal, or mirror images of one another. This should be taken into account when considering how this plays into the heating or the cooling of the oceans. johnd, I was responding to Muoncounter, and to a specific challenge by Inconvenient Sceptic. With regard to ENSO, you are neglecting the fact that ENSO involves a redistribution of heat over depth in the pacific ocean. In particular, the deep warm waters of the Pacific Warm Pool are redistributed across the surface of the tropical Pacific. Therefore, as regards to its primary nature, it balances out in terms of energy distribution. Of course, the ocean interacts with the atmosphere through the surface, so an increased warmth at the surface should show similar feedbacks whether the cause is a change in forcing, or a redistribution of heat from the depths. Therefore we should expect a significant additional warming from El Nino events, and a significant extra cooling from La Nina events; which is what we in fact see. This contradicts denier claims of a low climate sensitivity. This additional warming (or cooling), however, will not introduce a trend to global temperatures because the same feedbacks operating in reverse will remove the additional warmth (or cooling) from an ENSO fluctuation from the atmosphere.